As a leader in induction heat treating since 1977, Zion Industries offers professional, custom automotive heat treating. Induction heat treating automotive parts can add the strength you need to make durable, high-quality vehicles, even if you need a large run of parts. Custom heat treating for automotive parts requires a specialized thermal treatment process. The experts at Zion are prepared to provide you with efficient, faster service to meet all of your heat treating needs. 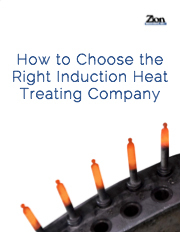 Why choose Zion for automotive heat treating? We provide custom heat treating services that can greatly improve performance and durability for any make or model. We work with you on every level, from engineering support and prototype development to large volume production runs with programs in the millions of pieces at any of our locations. In addition to having locations in Michigan, North Carolina and Ohio, we also serve areas such as Pennsylvania, Kentucky and Tennessee.